Why is Hydronic Heating the best alternative to traditional central heating? Is your house cold in the winter? Are your gas and electricity bills too high? Want to wake up to warm towels and a cosy kitchen? Are you fed up with the du﻿﻿st and ﻿﻿dehydration caused by your gas heater wall unit? Frustrated with the constant drone of the heating fan? Economical, quiet, clean, recommended by asthma and allergy associations around the world. Low maintenance and heats evenly throughout your house. A wall mounted, internal or external boiler heats water. This hot water is then pumped via a pipe circuit (loop) to radiators/panels and back to boiler to be heated again when necessary. The radiator or panel temperature can be altered via a simple temperature adjustment dial located on the radiator/panel. This is called a thermostatic valve. Hydronic heating is the European heating technology that is being embraced by Australia, particularly Victorians and Tasmanians, due to its high efficiency and user friendly features. We have been installing Hydronic systems for over 20 years and have installed over 500 systems. Let us keep you warm this winter. We prefer to use Bosch boilers from Germany, DeLonghi panels/radiators from Italy and a selection of towel rails which are both European and Australian made. We also install in-slab or underfloor heating which can be combined with wall panels. Reece also stock many hydronic heating products which are not only high quality but also reasonably priced. The Bosch range of Condens boilers are over 90% energy efficient saving you money. The water used for Hydronic heating can be heated in a variety of ways. 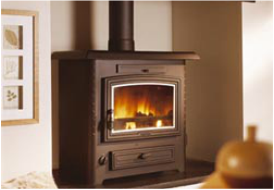 Solid fuel, wood burning stoves and boilers. We install two system types. System One - Boiler heats panels/radiators and/or underfloor heating coils. System Two - Combination Boiler heats panels/radiators and/or underfloor heating PLUS this same boiler supplies continuous hot water flow to all your hot water outlets. We can retro fit these superb heating systems into 90% of Australian homes and of course all new builds.Using the excellent Bosch products ensures the heating system we install for you will be low maintenance and has a 91% efficiency. Price for installation (Parts AND Labour!) for these superior central heating systems start from just $8,799.00 inc GST! The Bosch range of Condens boilers are over 90% energy efficient saving you money. Hydronic heating is the ultimate heating solution which has been used in Europe for generations. Savings on your gas bill. Comfortable, natural and even heating. We use Bosch products due to reliability, efficiency and service support. We have been installing Bosch products for over 20 years in Europe and Australia. Looking after heating and plumbing needs from Melbourne to Gippsland. Looking after Victorian's plumbing needs we cover from Melbourne to Sale in Gippsland, we offer a pleasant, professional and prompt service.